The major difference between the traditional and online market is use of technology. While traditional marketers use the attractive color, lights and designing to attract the customers, the online e-commerce market is no exception in this matter. The e-store uses the thoughtful measures for making their online shop more attractive and easy to visit. In the term of an Internet store, the design is the main thing that online retailers should maintain. But, online eye-catching color is not enough, it should have friendly usability features and easy to optimize. Overall there are some things that can help to develop your e-business in an appropriate manner. Customers determine an online shop more convenient only if it’s interface design is well portrayed and instructive. One is recommended to design an online e-store efficiently. Thus, visitors will find it as an interesting online platform and easy to navigate. This will result to make it a preferable store to shop again and again. CTA should be catchy and compelling to the customers. Instead of ‘click here’, ‘learn more’ and ‘more details’, you are suggested to use ‘buy now’, ‘cheaper price’ ‘free shipping’, ‘buy now to get discount’ and many more. Direct CTA will get the online buyers instantly. After adding any product to a shopping cart, they find the icon to confirm that item is registered or not. So, if you make it visible on your web page during the online shopping process, it will ensure the customers for registered item. Additionally, you should provide instructions about check-out and visible shopping cart. Throughout the process, take care of the color scheme and designs. A testimonial and review page on your e-commerce site plays a big role to increase the conversion rates. 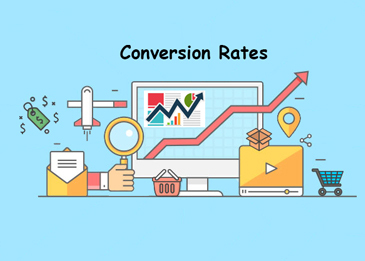 It can increase the consistency of visitors and convert the potential buyers into recurring buyers. No matter, it is a good or bad review, just put it on your website and let the visitors acquainted with the heights of your services. If you meet with their expectation they will surely hit the CTA button. Keep one thing in your mind that positive review is able to earn higher than negative. A good reason for giving a picture of your products is, it will easy to pick, touch and examine before buying. In the term of online shopping, lack of your product image is a big hindrance. Display your product image in multiple angles along with zoom-in/zoom-out options on the images. If you are interested to create your e-commerce website specialized in higher conversion, you can hire the experts at Base Creative. Our professionals are handy with various technical tools to provide superb results.